Many of us depend on one or two (OK, nine) cups of coffee to get through the day, but too little can make you feel lethargic if you’re used to a lot and too much can sometimes cause you to feel shaky, less productive and wide awake at midnight. Well, a new app developed by scientists working at the Pennsylvania State University aims to provide you with an accurate reading of just how much caffeine is in your system, whether you’re a fan of the Java or the fizzy drinks, giving you an idea of how much more you can consume in a day without feeling too jittery. 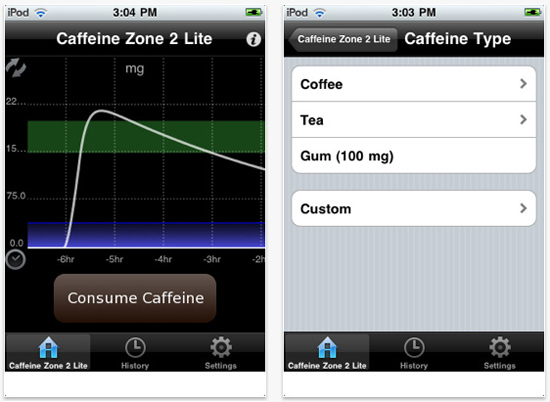 The app is available for the iPhone, iPad and iPod Touch and relies on users manually inputting how much caffeine they’ve consumed already, when they plan on drinking their next cup and how quickly they’re planning on consuming it. The app then works out whether the user should go ahead and drink it. The Caffeine Zone application uses a simple formula, people with between 200 and 400 mg of caffeine in their bloodstream are in the best mental awareness zone and anything out of that range is too much (or little). The app then goes on to generate a chart, which shows you what your caffeine level will be for the next 24 hours so you can make a judgement call about whether you should REALLY be having that second espresso at 8pm. Just like the apps that monitor your alcohol intake, it can be hard to remember to keep updating it, and if you miss just one drink it’ll mean any readings afterwards are pretty useless. However, if you’re disciplined and interested in finding out how many cups it takes to make you more productive then give Caffeine Zone a try. Available from iTunes for free.